Nope Shaun, spot on.... couldn't have put it better myself! or am i wrong :? Looks highly plausible in theory but I'd reckon it is a load of cobblers. I go with WG stick them in the ground give em water and a bit of feed the number of shoots will not have a bearing on the yield. Sorry mate, I'm not gonna dig them up just yet - mine have already been in the ground for months developing ROOTS and not just sprouts. In support of my theory, m'lord, I offer as evidence the potato in a barrel method. Major crop of potatoes from just a single seed tuber. Like its relative the tomato, I believe the potato can produce roots from earthed up foliage; unlike the tomato, these go on to produce tubers. when i picked my seed spuds up from him the other week they had started to chit and he had removed all but one,i did ask him why and thats what he said. As you say WG that's the theory but how many of us actually do it...i don't. I've seen me buying tatties late and just putting them in the ground...it all works out in the end. Water is the vital bit when the tubers are swelling to get a good crop....afterall I don't want mammoth sized tatties just tasty tatties. We save our own potato seeds for a few years, WG, and that's about the size that give the best yields. You'd think the bigger the tuber, the bigger the yield, but it just doesn't work that way. At about 4 years, we buy fresh seed potatoes and really have no problems other than couch grass getting out of hand, or our nuisance Colorado potato beetles gorging on plant tops. An organic market gardener I know, walks along the rows each day with a car snow brush moving the leaves so that any bugs fall into the bucket he carries below, and all contents are dumped in the chicken runs. We solve ours by squishing the greedy blighters - just wear old clothes because the squirting goo stains. Interesting as my FIL used to say the same...the smaller the seed the more tatties you get. I've saved some seed for this year and they are large marble sized ones whereas the ones i've bought are slightly bigger. Will be interesting to see what the difference in crops are. Have you seen the size of seed that seed growers plant? About the size of a big marble. I believe you can actually cut a large seed potato in half before planting, as long as each piece has an eye, so potentially doubling your crop. Well, like any vegetative reproduction, it will certainly grow but the cash-starved seed potato growers will point out that you are giving plenty of opportunity for disease to affect the cut faces. Ye pays yer money and ye takes yer chance, I guess. and what about those potato plants you can buy what are they all about :? I thought we'd put this thread to bed last night !! 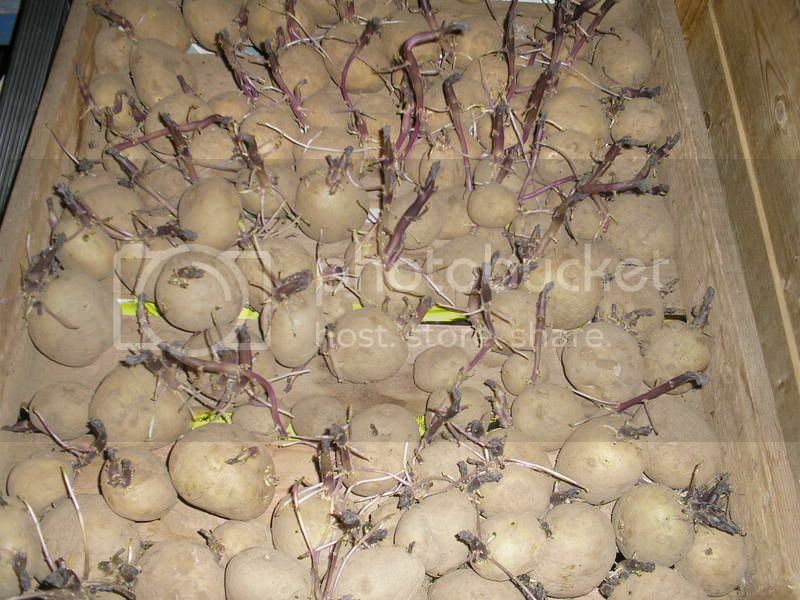 Potato plants have been grown vegetatively in near-laboratory conditions from small pieces of tuber. Much like slips from sweet potatoes, I guess. They are a way in which the grower can extract maximum return from a minimal quantity of genetic material in a single season. Frequently used for very old or very scarce varieties.